PT Kereta Api Indonesia (Persero) - KAI or referred to as "KAI Group" is a state-owned raiway corporation in Indonesia and operates primarily as a railways operator in Java-Bali and Sumatera regions. KAI Group is based in Bandung West Java and is fully-owned by the Government of Indonesia. The Company's head office is registered at Jl Perintis Kemerdekaan No 1 Bandung. As of December 2015, Operations are supported by a total of 9 Operation Area Offices (DAOP), 3 Regional Division Offices (DIVRE), 3 Sub Regional Division Offices (SUB-DIVRE), 5 Balai Yasa spread across Indonesia. 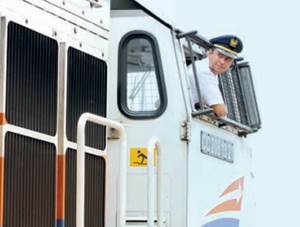 PT Kereta Api Indonesia (Persero) also directly employs nearly 25,361 staff. KAI Group has 6 directly-owned subsidiaries; namely PT Kereta Api Logistik (99.90% owned by KAI Group), PT Kereta Api Properti Manajemen (99.90%), PT Kereta Api Pariwisata (99.90%), PT KAI Commuter Jabodetabek (99.78%), PT Reska Multi Usaha (95.01%), and PT Railink (60%). In 2015, PT Kereta Api Indonesia (Persero) succeeded in posting overall improvement in its performance. KAI Group reported total revenue of Rp 13,938.90 billion in 2015. This reflected an 33.02% increase from Rp 10,478.07 billion in 2014. KAI Group’s net profit in 2015 amounted to Rp 1,398.24 billion or 62.27% increase as compared with Rp 860.87 billion in 2014. This figures was stated by PT Kereta Api Indonesia (Persero) in its Annual Report 2015 as quoted by JobsCDC.com. Senior High School (SMA) or equivalent : as low as 18 (eighteen) years and a maximum of 25 (twenty five) years old. Diploma Degree (D3) : as low as 22 (twenty-two) years and a maximum of 30 (thirty) years old. D3 from all the majors with accreditation minimal "B" on the date of graduation and GPA of at least 2.95, and has a high school background in SMA IPA / SMK Mechanical, SMK Electrical and SMK Automotive. SMA IPA or SMK Mechanical, SMK Electricity, SMK Automotive with minimum average national exam score (NEM/UAM) of 6.5. Domiciled in Sulawesi as evidenced with valid ID Card (KTP). Not involved in drugs and psychotropic substances. Willing to be placed in the working area of ​​PT Kereta Api Indonesia (Persero). Does not have marital relations with the employee of PT Kereta Api Indonesia (Persero). Passed in all selection stages organized by the recruitment committee of PT Kereta Api Indonesia (Persero). Copy of accreditation certificate at the time of graduation from BAN PT (minimum B) or from the college. Latest color photograph 4x6 (4 sheets). JobsCDC.com now available on android device. Download now on Google Play here. Please be aware of recruitment fraud. The entire stage of this selection process is free of charge. PT Kereta Api Indonesia (Persero) - External Recruitment Program Machinist KAI Group August 2016 will never ask for fees or upfront payments for any purposes during the recruitment process such as transportation and accommodation.